The NFL draft is over, and while the season is still a solid four months away from starting, the recent release of the NFL schedule and win totals have provided us at the PFF Forecast with some opportunities at value. After last week’s “Lock of Week” of the Bengals OVER 5.5 wins, we go with an under in our first post-draft pick. I think there is a lot of excitement in Oakland with the recent (re)hire of head coach Jon Gruden. While Gruden generated 38-26 record during his first stint in Oakland, he was below 0.500 and reached the playoffs in just two of his final six seasons as an NFL head coach with Tampa Bay, and hasn’t coached since 2008. While Derek Carr is likely more talented than any quarterback he had during his time with the Bucs (sorry, Elbow Pad Brad), he is coming off of a season in which he was a third-tier quarterback in our quarterback clustering algorithm, earning a grade in the lower half of the league on NFL throws (link to college to pro article). The offensive acquisitions of Jordy Nelson, Ryan Switzer, Breno Giacomini and first-round pick Kolton Miller are not trivial, but they are likely not as valuable in reality as they appear to be to the Raiders. While there is certainly a chance that Chucky can move the lever, the other side of the ball was more the issue for Oakland a season ago, as they were 28th in opponent-adjusted pass coverage grades in 2017, and were just 24th in our overall defensive ratings. Rashaan Melvin (UFA), Marcus Gilchrist (UFA) and Nick Nelson (fourth-round) are in, while Sean Smith, David Amerson and T.J. Carrie are out, giving them a glimmer of hope that things can turn around. However, I’m bearish on the likelihood that Oakland can come close to approximating the stout defenses that were characteristic of the Tampa Bay teams that Gruden was able to take deep into the playoffs a decade and a half ago, especially against a schedule that includes Jared Goff, Philip Rivers (twice), Russell Wilson, Andrew Luck, Jimmy Garoppolo, Ben Roethlisberger and the Chiefs’ offense (twice). Aside form the return of Gruden, there are numerous reasons to think the Raiders will return to the type of team we all thought they could be entering last season when our model pegged them right at 8.5 wins. Carr went from a PFF grade that ranked him ninth in 2015 and sixth in 2016 to a miserable 21st last year. The massive culprit was his horrendous play under pressure where he ranked 38th in PFF grade among quarterbacks (get this and more in the QB Annual) and was in the second to lowest performance cluster under pressure. 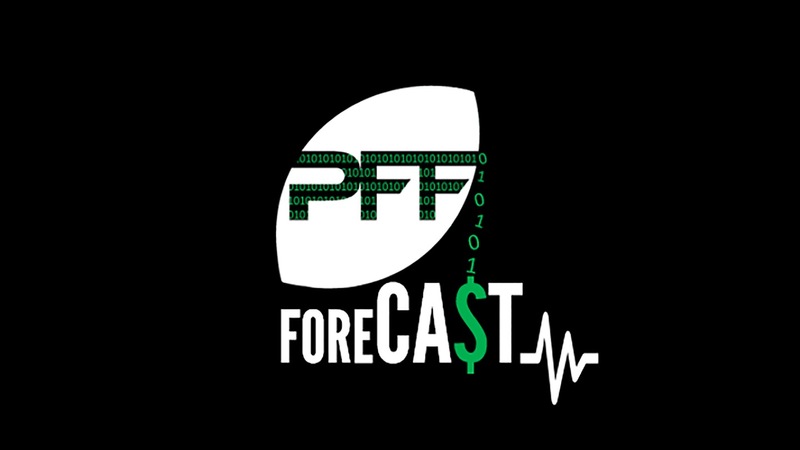 As we’ve waxed poetic about on the PFF Forecast many times, play under pressure is not stable year to year (that message is brought to you by Kanye West). Carr’s passer rating under pressure stayed above 70.0 in both 2015 and 2016 and plummeted to 40.8 last season, the only quarterback below that mark in 2017 was DeShone Kizer. The Raiders passing game supporting cast fell into the lowest cluster after consecutive seasons of finishing in the second-worst group during Carr’s two best years. Raider pass-catchers managed to drop an astounding 6.8 percent of Carr’s 492 aimed passes (third-highest), with Amari Cooper dropping 17.2 percent of on-target passes (also third-worst). Drop rate is another unstable stat that we should avoid when making predictions about the future. To top it all off, Jordy Nelson is coming to town so there’s a chance that he instructs Carr how to alienate his family, grow real facial hair, do commercials with a cute dog and thereby become a better quarterback. Notice that the analytics of the previous sentence was done with a keyboard. There are many grumblings about how Gruden has no idea what he’s doing from a team-building standpoint which is totally ridiculous seeing as how he drafted the No. 3 player on PFF’s big board in the fifth-round (Maurice Hurst). It is not uncommon for visionaries hailing from Sandusky, Ohio to be doubted – Tommy Boy overcame and so will Chucky. Queue the “Back in Black” MNF commercial, the Gruden scowl and a 9-win szn. 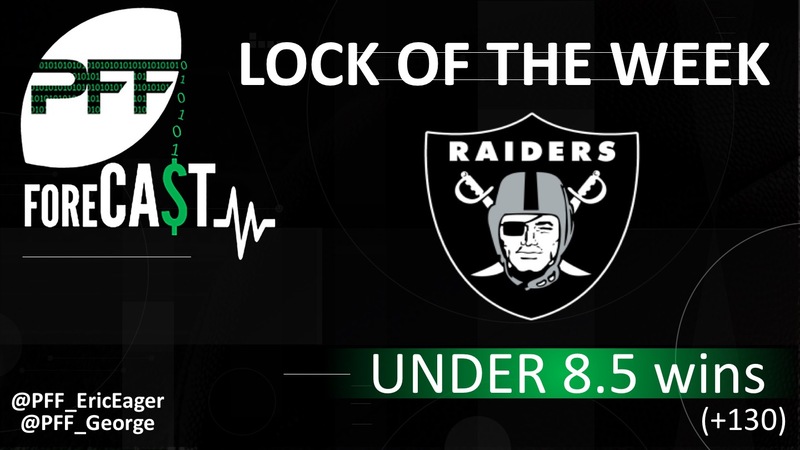 For further discussion on the Lock of the Week, listen to the PFF Forecast and send questions for @PFF_EricEager and @PFF_George to answer on the podcast by submitting a review on iTunes.